This article by Pam Kragen appeared in the San Diego Union-Tribune, Jan. 3, 2018. LOS ANGELES, CA – Luthiers for a Cause is proud to announce that the six custom tenor ukuleles created for its groundbreaking project The Voice of the Luthier have been sold as a set for $100,000. All of the proceeds are going to The Ukulele Kids Club, a 501(c)3 non-profit whose mission is to harness the healing power of music by sending hospitalized children home with the gift of music for life. The Ukulele Review video podcast showcased the "The Voice of the Luthier", a charity effort organized by Luthiers for a Cause, which sought to demonstrate how six world-class builders bring their own aesthetics and voicing to nearly identical sets of wood, sourced from legendary one-of-a-kind trees. The idea for the project came about to help answer the question about how the woods used and the builder each contribute to the final tone of an acoustic instrument. The woods selected for the project are extremely rare. The body wood is from "The Tree", a one-of-a-kind, uniquely figured Honduran mahogany giant that laid in a ravine for almost 20 years before it was re-discovered. No other Honduran mahogany tree like it has ever been discovered. The soundboard is from Lucky Strike redwood, which is sourced from a storm-felled redwood which straddled a small ravine when it fell. A section of the tree the air-dried over many years, yielding redwood that has a much higher stiffness-to-weight ratio than is typically found in redwood. As a result, this redwood is said to provide the best attributes of both redwood and spruce. These prized instruments will be auctioned by The Ukulele Site (https://theukulelesite.com) beginning in December. All proceeds will go to The Ukulele Kids Club, who provides ukuleles and music therapy to kids dealing with serious medical problems. 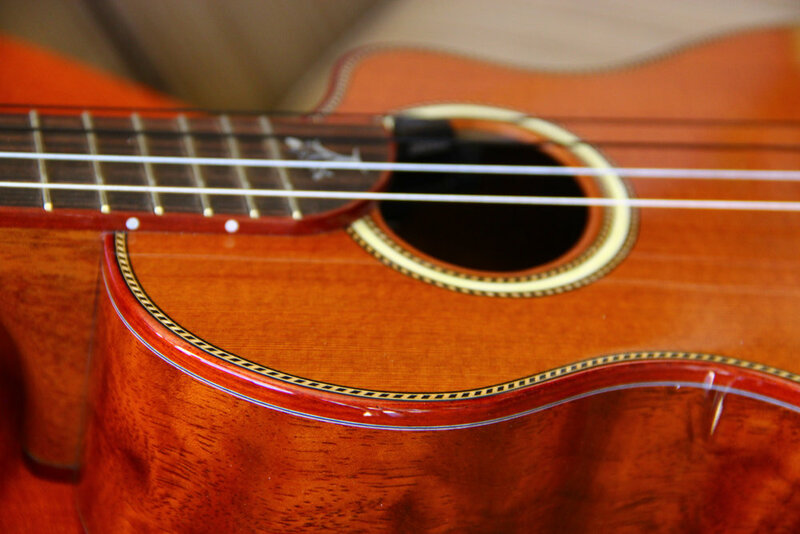 Over 4,100 ukuleles have been placed in the hands of children at more than 200 hospitals who work with board-certified music therapists. You can learn more about the luthiers and the woods used, buy LFAC merchandise and even donate straight to UKC on the Luthiers for a Cause website (www.luthiersforacause.org). Every $40 puts a ukulele in the hands of a child in need of the healing power of music for life. The big unveiling is here! Come see and hear the Luthiers for a Cause "Voice of the Luthier" ukuleles at the Hawaii Ukulele Festival, which is being held at the Princess Kaiulani Hotel, Waikiki (November 17-19). These very special instruments and those of more than 30 other builders will be on display Friday and Saturday from 11-4pm and Sunday from 11-3pm. Six of the world's leading luthiers built these fine instruments from wood sourced from two legendary trees. The Ukulele Review will be doing a podcast showcasing the ukes as well, which will be available later in November. 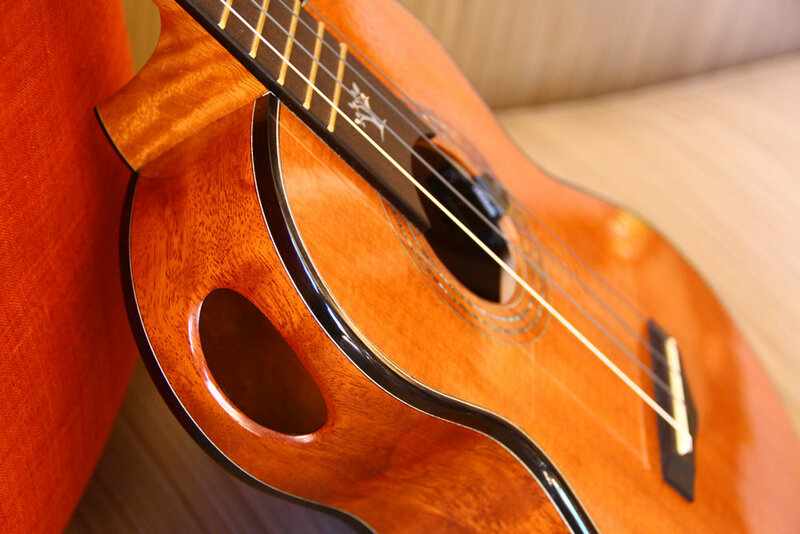 The instruments will be auctioned beginning in December through The Ukulele Site, with all proceeds going to The Ukulele Kids Club to support music therapy at pediatric hospitals, including Kapi'olani Medical Center for Women & Children. Luthiers: Steve Grimes, Beau Hannam, John S. Kinnard, Jay Lichty, Jake Maclay and Joji Yoshida. Other sponsors: Harvey Leach (master inlay artist & source for Lucky Strike redwood), Rob Rodgers (fine tuning machines), Andrew Kitakis (The Ukulele Site, Oahu Cases, The Ukulele Review), Jay Howlett (source for The Tree body wood), Kimo Hussey & John Covey (Hawaii Ukulele Festival). Luthiers for a Cause and Ukulele Kids Club raised funds to help bring the healing powers of music to children living in areas ravaged by Hurricane Harvey. Thanks to a dedicated group of volunteers on the ground in Houston and the support of the American Red Cross, we will be helping some young people discover the joy of making music. The article below was written for Red Cross Chat. Ukulele Kids Club President and Founder Corey Bergman talks about the healing power of music and the Luthiers for a Cause project. Remember, it takes only about $40 to give the gift of music for life by putting a uke into the hands of a child in-need who is undergoing a serious medical situation. Learn more about The Ukulele Kids Club and make your donation here.